We cut to Lassiter at his hotel that same morning. 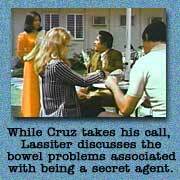 He meets Inspector Cruz and Lynne Walker for breakfast at an outside caf�. The Inspector hands a letter to Lassiter and begins to say something. 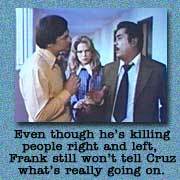 Cruz is interrupted by an urgent phone call. Cruz leaves the table momentarily. In the hotel room, Lassiter weathers a verbal lashing from his superior. "If you had taken proper security measures, that phone call wouldn't have been overheard!" Lassiter expresses no remorse for being a dipshit. "Sir, I have another hot tip for you - someone stole my medication." (WHOA!! Wait a minute - when the hell did that happen? It's not in the movie.) His superior fumes, "I assume it was in your attach� case. Did they steal that too?" Lassiter confirms that his case is indeed missing. "You get Trevor, that is, if you're still capable of handling the operation. Do it quietly without publicity. He's dangerous." Frank explodes, "Personally, sir I don't give a damn about the publicity. I care about the man. What happens if he goes off the deep end?" There is a long pause on the other end. Finally, his superior speaks up, "With the serious International implications, you may have no choice. Bring him back or eliminate him." Lassiter grows pale and stammers, "I just wanted to hear you say it, Sir." 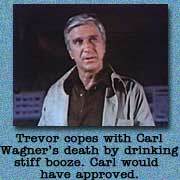 Meanwhile, Trevor travels to the local dock to meet Kitolis, the man Wagner called about a boat. He cautiously ascends the staircase. He hears a commotion coming from behind a door. "You lied about Wagner - you will tell us everything about this!" yells a voice. Trevor pulls out his pistol, and uses it to knock on the door. The room grows quiet. The doorknob turns slowly. A bearded man opens the door. Trevor asks him, "You have a friend named Wagner?" The man says yes. " So do I," is Trevor's response. "What can I do for you?" the bearded man (Kitolis) stutters. Trevor answers evenly, " I have a business proposition for you �" Trevor kicks open the door and pushes Kitolis aside. He then punches one thug in the chest. Trevor fires two shots into the door, killing a goon hiding behind it. A final shot takes out the first goon and he falls out the office window. Trevor doesn't answer, but inquires about Wagner. "He's dead," Kitolis says. The words hit Trevor like a freight train. "WHAT?" John holds his head in pain. Twinkly music floats in to indicate a drug withdrawal moment. Trevor snaps out of his daze. "Got any liquor here? Pour two drinks � pour them where I can see them." Kitolis obeys and fetches some booze. Lee Su fumbles through her purse and finds a bottle of prescription painkillers (or downers). She hands them to Trevor, who proceeds to ingest roughly half the bottle. Lee Su instructs Trevor to lie down. He begins babbling as the drugs take effect. "It's not the same anymore for me. I don't know where it's different, but it's different for me now. When it's all out of me �" She interrupts him. "Shhh - the pills are talking." Trevor laughs, "Pills! Now that's something different." He draws her close to him. "Lee Su: I'm not programmed for love." She cradles him tenderly as The Lonely Man song sets a somber mood.